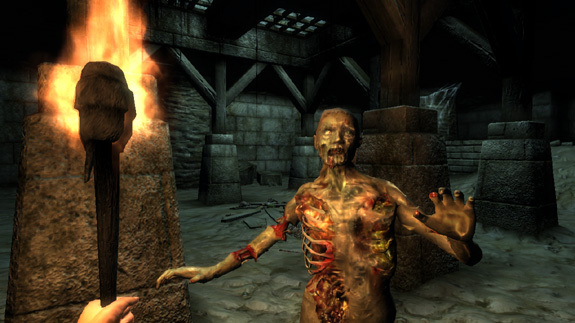 Elder Scrolls IV: Oblivion has much to prove, considering the resounding success its’ predecessors have achieved. 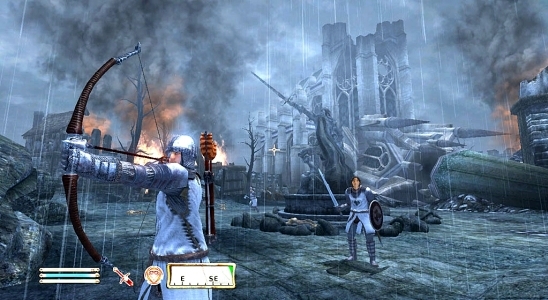 With Bethesda’s latest entry into the Elder Scrolls universe, players have the opportunity to engage in a heroic crusade against the evil forces of Tamriel. Boasting over 100 hours of game play and with over 16 square miles to travel, Elder Scrolls IV: Oblivion is easily one of the biggest games ever conceived. But with these brow-raising statistics in mind, does the game truly live up to the hype? Oblivion’s storyline is quite simple: the throne of Tamriel lies empty, after the untimely death of Emperor Uriel Septim VII. Consequently, the gates of Oblivion (Tamriel’s version of Hell) begin to pop up all across the lands, with demonic creatures pouring out and destroying everything thing in their path. Your job is simple: find the illegitimate son of the Emperor and put him into power before the evil forces of the land destroy all that is green and good. What Bethesda did so wonderfully is that the player is not forced to either go along the main storyline, or be pushed into the side quests. The choice is literally yours. Aside from the mandatory opening mission, you can complete all the side quests, without even touching the main storyline. This allows for a laid-back, relaxed game session. The one problem with this lack of mission structure is, some players may feel completely overwhelmed. And actually, that is a legitimate concern. When the game truly begins, the character is practically naked–no good armor, weapons or potions, and it is hard to get on your feet. However, these types of problems come with this kind of open-ended RPG genre, so it really isn’t a negative that detracts from the entire experience. Without spoiling the game, the ending suddenly springs on you and kind of ends abruptly. This isn’t necessarily a negative, but it is something to point out. Once the main storyline has ended, the character is free to complete any remaining side or guild quests, or just amass a large sum of money by stealing than reselling. Within the 16 square miles of terrain, there must be some towns, right? Within the 9 towns that dot the landscape, players have the ability to buy and sell goods, steal, talk with the townsfolk, and join a guild. Whether they be secret assassins (the Dark Brotherhood) or wannabe wizards (the Mages Guild) all of the missions associated with each guild are fun and rewarding. The missions could range from going to one city and grabbing a particular item, to killing a specific member of society in the middle of the night, which, may I add, is a lot of fun. As you complete more and more of the guild missions, you’ll eventually find yourself head of the respective guild. Within your new position, you may find yourself getting a share of the guild’s earnings, or, if you don the mask of the Grey Fox, you will be loathed and chased by the town guard. Of course, the guilds are completely optional, and do not add or detract from the main storyline.